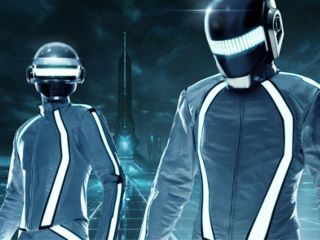 Daft Punk will also make a cameo appearance in Tron Legacy, as this just-released photo sort of proves. There seems to be almost as much buzz surrounding Daft Punk's Tron: Legacy soundtrack as the film itself, and this is set to get even noisier now that a full track from it, The Game Has Changed, has been officially 'leaked'. Previously heard in snippets in the Tron: Legacy trailer, this pulsing orchestral piece can be heard in full (although that's only 90 seconds) below (it was originally posted on the Tron: Legacy Facebook page). The bad news is that the release of the complete soundtrack has been pushed back to December 7, but we may well hear more from it before then. It's also emerged that Daft Punk will score the Tron: Legacy video game, reportedly with songs from the film soundtrack and more original material.